To the surprise of many, Gaijin has released their second Devblog on Japanese Ground Forces only a day after their prior release. This time, we get a preview of the Chi-Ha, Japan's primary battle tank of the Second World War. This probably isn't your first time getting acquainted with the Chi-Ha; at Igromir you all saw a preview of the Chi-Ha Kai. 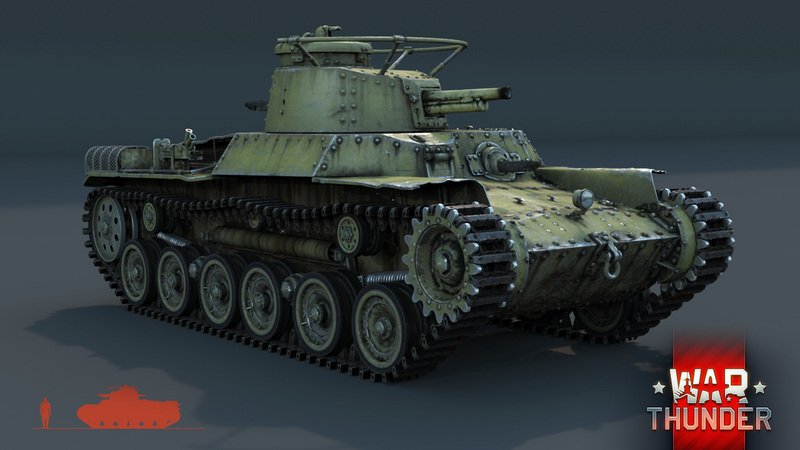 Today you'll get a look at the second production model of the tank, the Type97 Chi-Ha. By the mid 1930's, Japan was already aware of the significance of tanks in the military. Many nations had already started their own development of tanks that would serve as a basis for the nation for years to follow. Japan was not an exception; in 1936 the Imperial Japanese Army sought to design a tank that could support the infantry in combat and that could also keep up with advancing trucks and light vehicles. Japan had relied on the Type89 I-Go medium tank for supporting the troops, but by this time the Army was aware of the poor mobility and armour protection of the model 89. The same model of armament, an upgraded 57mm, was to be kept as it had proved useful in the field. The IJA needed also needed a heavier tank that would capable of fulfilling the infantry support role, with armor sufficient to defeat small-arms fire and light anti-tank weaponry. These dual requirements of mobility and armor eventually resulted in a compromise: the Chi-ha would sacrifice armour for better offensive capability and an emphasis on mobility. The tank was first designed to meet an overall weight of 13.5 tons, with an interior volume similar to that of the Type89 medium tank. 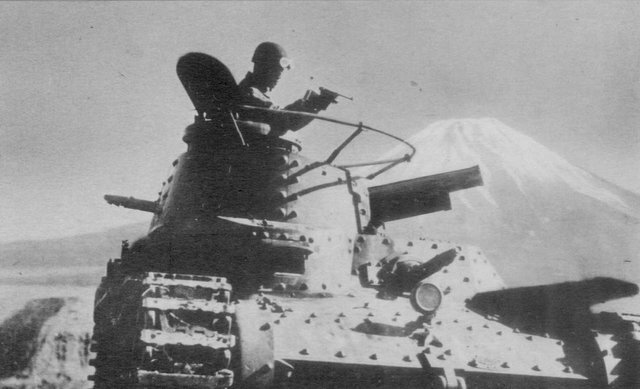 The vehicle would have a two-crew turret, something that was unique to Japanese tanks; the past most units were single-man only. To improve on performance over the Type 89, the size of the turret ring was increased in order to accommodate an upgraded version of the 57mm cannon. From these initial specifications, Army staff had decided to reduce the overall weight of the tank to only 12 tons; the extra 1.5 tons of equipment and armor was deemed an unnecessary addition that could hinder mass-production of the vehicle. Contemporary Japan was limited in its industrial capacity, and its engineers were often forced to come up with creative solutions to achieve their goals with limited resources. This consideration also prompted the Army to restrict the crew in the turret to one, though the members of the tank school ultimately rejected this proposal. In the tank school, the proposed one-man design was seen as an outdated method of the old world--two turret members were necessary to show Japan was modernizing along with other nations, along with practical considerations of crew workload. The debate over crew size meant that the Chi-Ha had a series of turrets designed for it, but in the end it was agreed to simply use the basic turret that was smaller and easier to manufacture. This new turret design would also used on the Type98 Chi-Ho model D.
Regardless, in 1937, Mitsubishi Heavy Industries produced two prototypes for inspection. One had been constructed in the Osaka Arsenal, while the other was produced by the Army factory. The first prototype weighed 9.8 tons, less than what was originally called for, and was comparatively less capable. This tank was called Chi-Ni, and had a turret with only one crew member. This was Design B, the tank the Army staff preferred. The other was the Chi-Ha, at 13.5 tons. This was Design C, and had larger body with a two man turret. Both prototypes went through trials and performed similarly. However, the Chi-Ha was ultimately chosen due to its simplicity. The Chi-Ni weighed less than the Chi-ha, but it cost more to produce and was mechanically complex, something that would hinder Japan's capacity for production as time went on. The Chi-Ha was highly favored by the major factory companies, and after the trials seven of the largest offered terms for licensed production, including the Sagami, Hitachi, Ogura, and Nanba corporations. Prototype B, the Type97 Chi-Ni. Considerations of cost-effectiveness would also determine the Chi-ha’s choice of engine. During the inter-war period, many tanks were designed to use gasoline engines. However, gasoline was comparatively expensive to produce, and thus Japan found it necessary to give the Chi-Ha an air-cooled diesel engine. Diesel was also chosen for its light fluid weight when compared to gasoline's heavy lead. An additional bonus was that diesel fuel was less prone to ignition from outside sources. The air-cooled method was adopted after reviewing operations in Manchuria, where water sources were scarce in the plains. The choice of an air-cooled diesel was not without its own issues, however: as designed, Japanese diesel engines did not match gasoline engines of comparable size. Therefore, the tank would have to larger in order to accommodate a larger engine. Further, the armor thickness would have to be reduced in order to keep the weight of the vehicle down. Chi-Ha during training by young tank cadets. Little surprise to know - most Chi-Ha crew were physically larger than Ha-Go members. Yep, the fatter ones got stuck in the better tank! For its armament, the production version of the Chi-ha was fitted with a Type97 57mm main gun, mounted in a turret which was placed right-of-center on the vehicle. The gun was not intended for the anti-tank mission: its low velocity and short barrel length were intended to emphasize high-explosive firepower for better infantry support and damage to lightly armoured targets. The gun was an improvement, however, over the Model 89's Type90 57mm, with a similar firepower output. The gun weighed 160kg in total - 80kg for the cannon barrel. Development of this gun had began in 1936 as a redesigned Type 90 57mm howitzer intended to match the new vehicle. The trial version of the gun was finished in March of 1937, and performance trials were carried out at the Otsu river and the Osaka Arsenal. In May of the same year, the second test took place with a tank mock up. Later in June, the gun was fitted on a tank and tested for its final trial. This took place at the Fuji proving grounds, and finished the testing process. In August the gun was sent to the army tank schools for training and later implementation on Chi-Ha units. The production model weighed 2.58kg, had a muzzle velocity of 355.3m/s, elevation angle of +20/-15 degrees, and a barrel weight of 75kg. The total weight of the entire assembly was 150kg. The tank was given a variety of shells to match envisioned tactical situations. The Chi-ha’s primary ammunition was the Type 92 APHE shell, with a large filler of 103g of explosives, intended for use against concrete fortifications and vehicles. The shell only had a penetration of 30.4mm at 45m, and 25.7mm at 350m. The Chi-ha was also given a HEAT shell, which offered a better anti-armor performance with 55mm of penetration. This was deemed sufficient to meet the threats initially arranged against the Chi-ha; the best the Chinese Nationalist Army and assorted warlords had to offer at the time was the British Vickers Six-ton Light, equipped with a low-velocity 47mm OQF 3-pounder gun. The Type 98 cannon would rapidly reveal itself to be obsolete, however, when the United States entered the war with tanks such as the Sherman. To compensate, the Chi-ha would eventually be armed with a high-velocity 47mm gun. Chi-Ha tanks of the tank school training with new 57mm cannons. While the Chi-ha’s amour was sufficient at introduction, it was never going to last; IJA designers working in 1936 could not possibly have envisioned how rapidly tank amor and armament would advance after 1936. The Chi-Ha’s armor was intended only to defeat Chinese anti tank rifles and early Russian tanks, which were the threats that the Japanese envisioned at the time. Thus, the maximum thickness of the tank’s armor was 30mm on the turret mantlet. The standard thickness was 25mm on the rest of the turret face and the hull. The turret face itself was curved to give it an effective thickness of 29.6mm. The sides and rear were only 20mm thick. 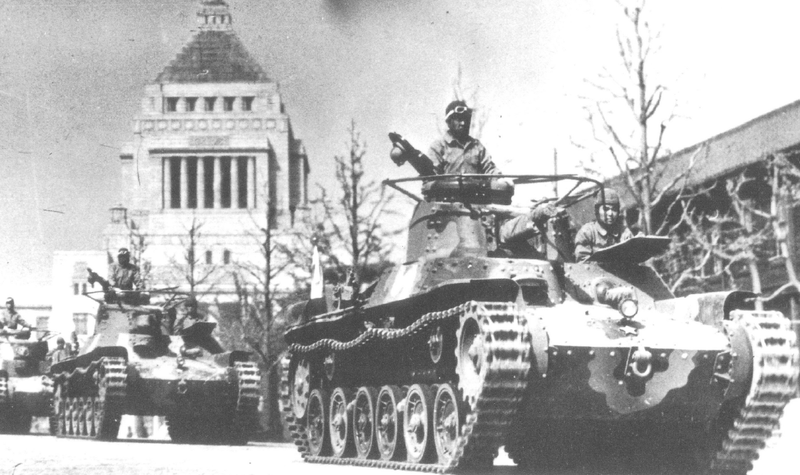 Type97 Chi-Ha tanks on parade. Against enemies which were similar to the threats envisioned, the Chi-ha would perform remarkably well. The tank had an excellent record during its service in Manchuria, Southern China, and the Pacific islands against the Americans and British during the early stages of the war; it was a competitive vehicle against the United States' M2 Light and M3 Stuart tanks, as well as the later M5. Despite this, Japan knew they couldn't rely on the Chi-Ha solely. As a result, the Type 97’s chassis was used as the base for many other vehicles, including assault guns and tank destroyers. The successor of the Type 97, the Type 1 Chi-He, would eventually improve the design with thicker armour and a better anti-tank gun. Nevertheless, by the war's end the Chi-Ha and Chi-Ha Kai were still the most common tanks in the IJA arsenal outside of the Japanese mainland. While modern variants and models were available, they were being kept on the Japanese home islands for what IJA planners envisioned as a decisive final battle to counter Allied invasion plans. As such, by 1945, a total of 2,208 units had been manufactured, second only to the Type95 Ha-Go's 2,375 production models. 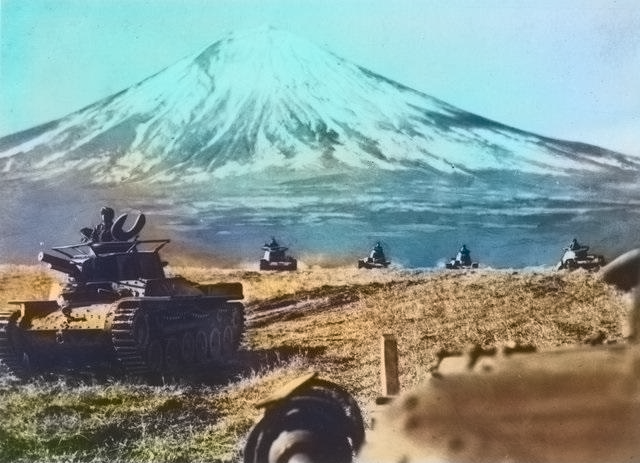 Stay tuned tankers, Gaijin is unleashing a wave of Imperial steel in the form of Japanese Ground Forces. Be prepared for the next devblog entry--you never know what dragons might be lying in wait! Sorry,but correction "APHE shell, with a large filling of 103kg of explosives. "i think you mean 103g.Other then that great post again. Np,can you explain what are those railings in turrets?They look very similar to what soviet used in Bt tanks. Meant for crew to use for handling. Theoretically. However many units were not given radio systems and relied on flags purely. Generally, these rounded atennas were used by crew for aid of transport. Did the Japanese put rail antennas on tanks without radios? The Soviets didn't, and there was a lot of complaining about this fact after Khalkin-Gol. Wait is Gaijin still going to do the first vehicles as premiums or no? Didn't the ki 102 use the same 57mm gun? If so can we expect to see in WT the APHE and HEAT rounds added to its ammo selection.